WE NEED HELP TO GROW PLANTS FOR OUR AUTUMN PLANT SALE AT TREBORTH. These sales earn the Friends money which we could not do without, money which supports the developments in the garden. Please grow some plants for us - every little helps. 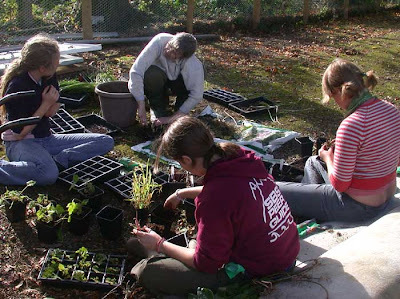 Contact Judith Hughes (01248 670673) or David Shaw (01248 364260) for details of which plants we want volunteers to grow and when or join in one of our many propagation sessions and workshops at the garden. Tell Judith or David if you are planning to supply us with plants for the sales so that we can co-ordinate growing - to prevent everybody growing the same thing. .......AND if you will want to buy any special plants at the sale (veg or flowers), ask us and we might be able to raise some for you.